Bharat Mumbai Container Terminals (BMCT) that was recently launched by PSA at the port of JNPT, India, started its first barge and train operations last week. According to PSA, a 90-TEU block train departed for Mandideep on 13 March 2018 and on 16 March, a second train left for Nagpur. 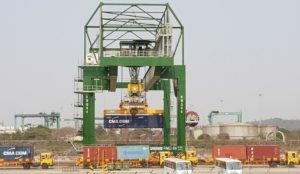 Two days later, an export train arrived at BMCT from Boisar carrying containers for other terminals in JNPT, these will be trucked less than 4 km via JNPT’s South Gate, to connect with export vessels berthed at those terminals. All the trains were operated by Container Corporation of India (Concor). 75 TEUs were loaded on board of Shahi Shipping’s “Royal Hugli” barge for the short marine transit to Mumbai Port Trust on 18 March. As we wrote earlier, BMCT is bound to change the regional logistic links and improve connectivity through increased rail and barge utilisation. Apart from a 1,000m berth, 16.5m of draft and 6 super post-panamax STS cranes at Phase 1 to handle largest containerships, the terminal also possesses the largest at JNPT rail yard and is one of the port’s two terminals able to offer customers direct barge connections. BMCT’s rail yard is equipped with 4 twinlift-capable RMG cranes serving three lines. It will be the only terminal in JNPT capable of handling 1.5 km-long, 360-TEU Dedicated Freight Corridor (DFC) trains when the DFC is completed. The rail capacity at BMCT’s railyard will be doubled by the end of 2022 with the completion of BMCT’s Phase 2, adding 4 more RMGs and 3 more lines to become the largest railyard in a container terminal in India. The terminal targets 35% of its volumes to be moved by rail.